Turtlist Media has been on TaiwaneseAmerican.org’s radar for several months, beginning with the release of The Chains of Attractions short films in August 2008. However, Turtlist founder Jason Lee was far from finished with his project. The recent re-launch of the Turtlist Media website (www.TurtlistMedia.com) provides a more interactive and navigable space where Asian Americans can publicize their work, network with each other, and learn about other talented artists like themselves. 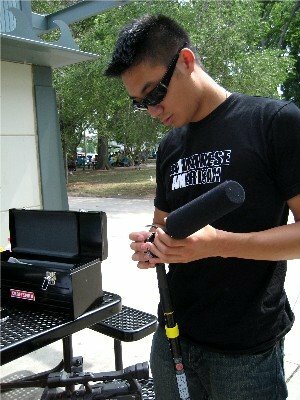 Besides Lee’s own Turtlist films, the website features other talented Asian Americans working in film, music, photography, dance, comedy, and spoken word. The website also features collaborative projects, such as the current “Savor the Flavor” project. “I think it’s a really cool idea, for certain Asian American composers to sort of ‘donate’ their own instrumentals, and then singers, rappers, and songwriters borrow them from the website, listen to it at home, and hopefully get inspired,” explained Lee. Although Lee began by contacting other artists to feature on his site, the growth of Turtlist Media has succeeded in bringing artists to him. “At first I would write these long letters about what I’m doing and how they might help me out,” recalled Lee. “Eventually more and more people started to hear about this idea, through whatever networking or friends of friends, and now people started to email me with their own stuff, which I think is a good sign,” he said with a relieved laugh. Lee can use a relief nowadays as he juggles multiple projects. His own upcoming Turtlist film “Toilet: The Adventures of a Peculiar Individual” focuses on an Asian American male who isn’t actually peculiar but can’t help but stumble upon awkward situations—a condition many people are all too familiar with. Lee also plans on keeping Turtlist Media in expansion mode, with regular updates being an important feature to keep readers coming back. He hopes one day to assemble a board of hardworking individuals to manage all the different aspects of a continually growing Turtlist Media in order to take on more projects and attract more talent from across the nation. Meanwhile, as an undergraduate at University of Illinois Urbana-Champaign, schoolwork also piles onto Lee’s to-do list—sometimes.